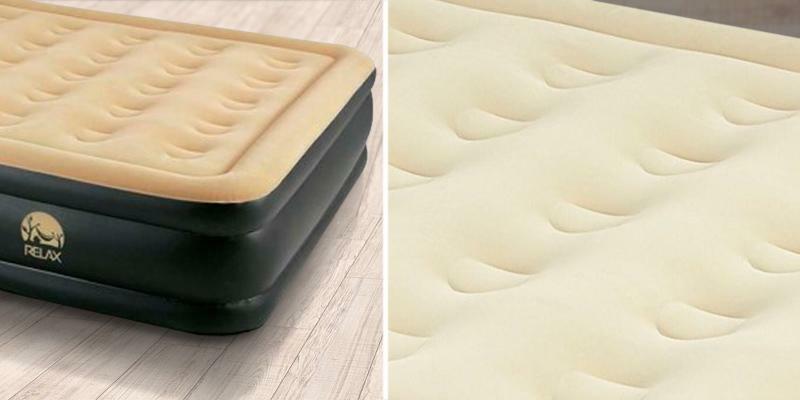 The orthopaedic construction of this air mattress ensures an even weight distribution. The bed is durable thanks to the puncture-resistant material. 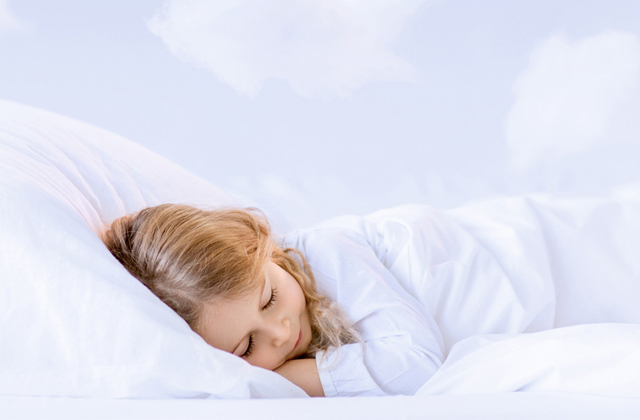 Some users do not like how a new airbed smells, though this smell eventually disappears. This air bed will help you select the most comfortable sleeping position as you can inflate or deflate it to your liking. The price for this mattress makes it a real bargain of a deal. The built-in electric pump inflates the whole thing in under 3 minutes. The top layer here features an extra-soft suede finish. 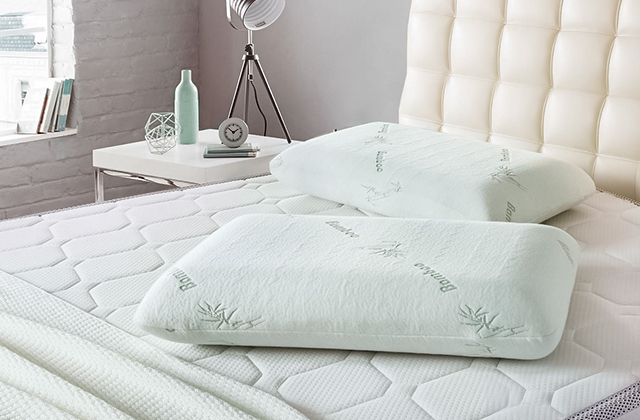 The sturdy edges provide extra stability and make the mattress even more comfortable. Doesn't come with a UK plug, so you'll need an adapter. The Intex 64136 provides a luxurious sleeping place for two people. The mattress is equally comfortable and sturdy. It isn't limited in its use and it won't disappoint you in the long run. The Bestway airbed takes very little storage space. 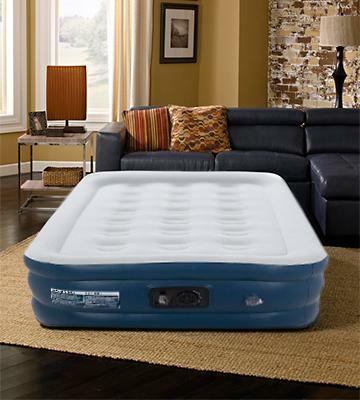 The air mattress can be used for water activities. A pump needs to be purchased separately. This air mattress being available at an affordable price will come in handy absolutely everywhere, be it at home, on a picnic, while camping, during water-based recreation, etc. Thanks to multiple round coils, this air mattress will give you a pleasurable sleeping experience. The inflatable bed is high and stable. The mattress might seem too stiff if inflated to the full height. It's a great inflatable bed large enough to provide enough place for two adults. Try it and you will realise that this air mattress is as comfortable as a conventional bed. 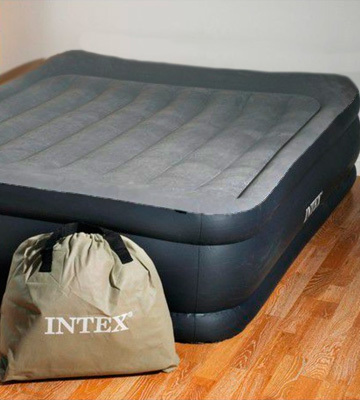 A built-in electric pump provides a quick inflation and deflation of the air mattress. The airbed is easy to store and carry (in a special bag). Avoid overloading this air mattress as it might lose its shape. It's a great single bed for people who travel a lot and need to have a comfortable sleeping place 'at hand' as well as for students in dormitories. The airbed is compact so you can take it anywhere you go. 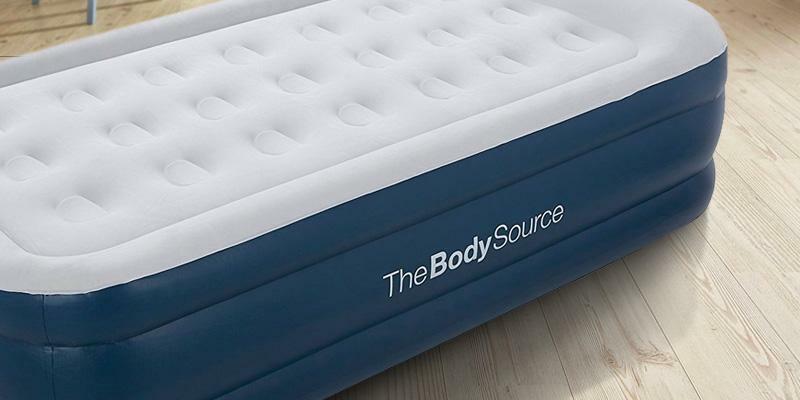 This single-size The Body Source model is an optimal air bed that provides a comfortable sleep for one person (no matter an adult or a child). The bed will come in handy in many situations any of us faces in life. For example, you can quickly make a sleeping place for your friend or relative. Also, the bed will help you sleep overnight in a tent if you like backpack tours. Of course, the Body Source air mattress will come in handy during outdoor recreation. One thing is for sure - this air mattress will provide you with a highly comfortable sleeping place. The airbed has a slightly raised edge so that you do not fall down in your sleep. Also, this air mattress has a built-in pillow that supports your head and neck. Needless to say, the top surface of the air bed is flocked. 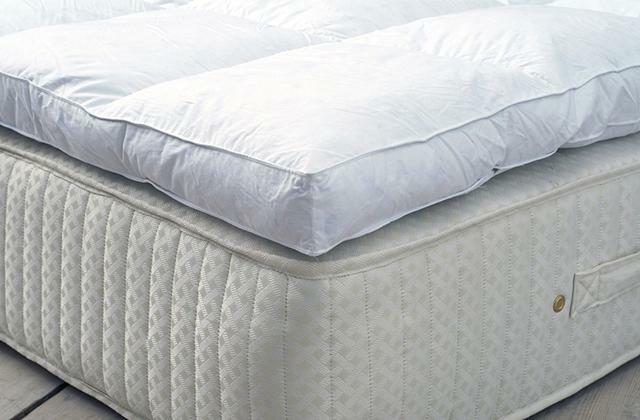 The mattress has 21 structured air coils and a three-chamber construction. Thus, the weight distribution is even and your body rests in a comfortable position all night long. 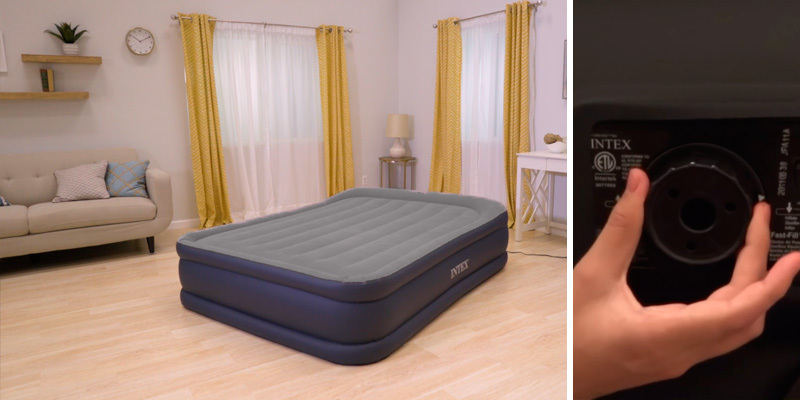 This airbed has a built-in pump which is powerful enough to inflate it in just 1.5 minutes. Deflation is also quick as the pump removes air from the bed. Though PVC is quite durable, the manufacturer includes a puncture repair kit that will be very helpful in case you accidentally pierce the mattress. The Intex 64136 is as much of an air mattress as it is a proper bed. The built-in electric pump inflates the whole thing in under 3 minutes, so you can keep it in the storage closet but be fully prepared for guests sleeping over at your place at the same time. The top layer here features an extra-soft suede finish. Though rather delicate, it isn't as frail as you'd think. That top layer is also waterproof, so you can use it outside or simply not have to worry about spilling water all over it and ruining the texture. Instead of the usual dividers, the model incorporates channel beams made of a thousand rock-solid polyester threads. 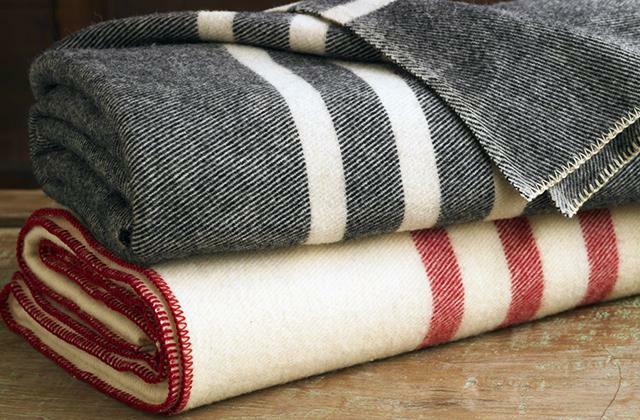 It makes the mattress strong, sturdy, and particularly resistant to wear and tear. First and foremost, a mattress has to be comfortable. Other than the soft top layer, the model comes equipped with a nice little built-in pillow. 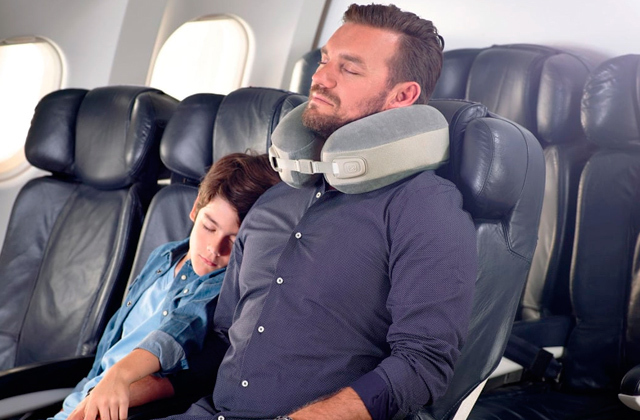 Of course, you can always use your own separate pillow, but that option isn't always available on the road, so we really like the aforementioned addition. 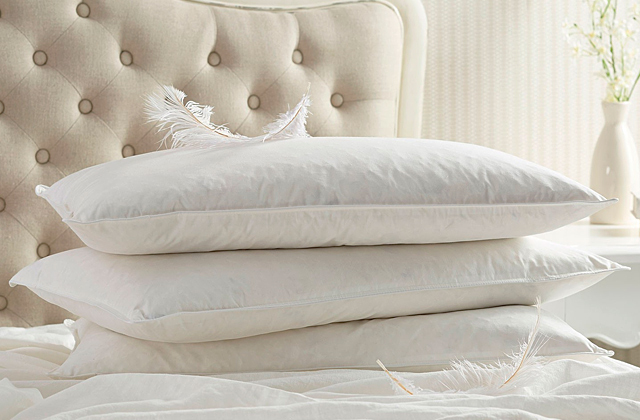 Aside from the pillow, this mattress includes sturdy edges. They provide extra stability and make the mattress even more comfortable. The whole thing adds up to 203 x 152 x 42 centimetres in overall dimensions, so it is nothing short of a proper double bed as far as the sleeping space is concerned. In closing, the Intex 64136 provides a luxurious sleeping place for two people. The mattress is equally comfortable and sturdy. It isn't limited in its use and it won't disappoint you in the long run. The Bestway airbed is a fairly functional mattress that offers a lot of advantages to its owner and the price for the unit is really wallet-friendly. First of all, this mattress serves as a comfortable sleeping place for your guests or relatives who stay overnight in your house or flat. Also, this affordable airbed will be useful if you often move from one flat to another or if your flat is under repair and you need a comfortable sleeping place. 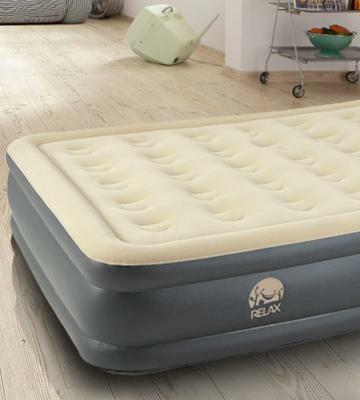 This small Bestway airbed is very convenient due to its construction: there are 40 round coils that perfectly distribute your body weight, allowing you to fully relax. The air mattress will be highly useful if you go on a picnic or go camping. The airbed is quite small (when folded) and takes little place in your rucksack, so you can quickly pitch a tent and inflate a full-size bed at a campsite. Needless to mention, it is very convenient to carry this inflatable mattress in the car. If you wish to spend a day by a lake or river, inflate this mattress and enjoy floating on it. Therefore, if you adore active leisure, this inflatable bed is certainly what you need! An air mattress will be highly helpful in such casual situation like having friends or relatives staying overnight, particularly if you live in a fairly small flat where every single square metre counts. 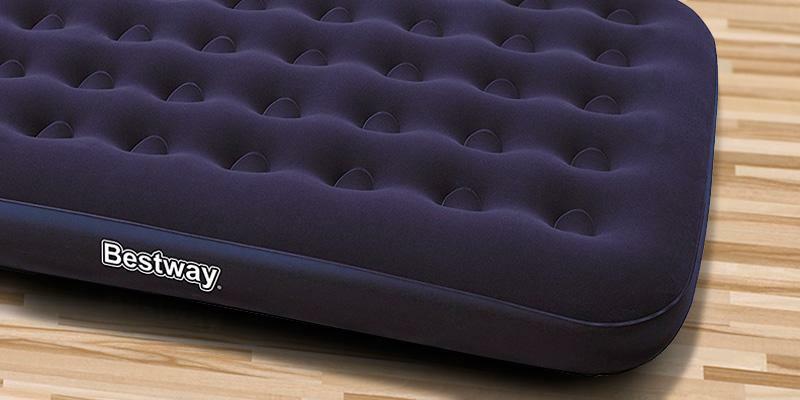 This FiNeWaY air mattress is one of the best inflatable beds available on the market. It's a double-size mattress that is large enough to provide enough space for two adults. We believe this air bed can be called orthopaedic as its design features 35 round coils for an even body weight distribution. Thus, the position of your backbone will always be optimal and you will not wake up at night having a back pain. The air mattress has a flocked top, which means bedsheets will not slip and it is even possible to sleep on the bed without bedding at all. The air mattress has a built-in air pump (240 V) that inflates it within less than 5 minutes. 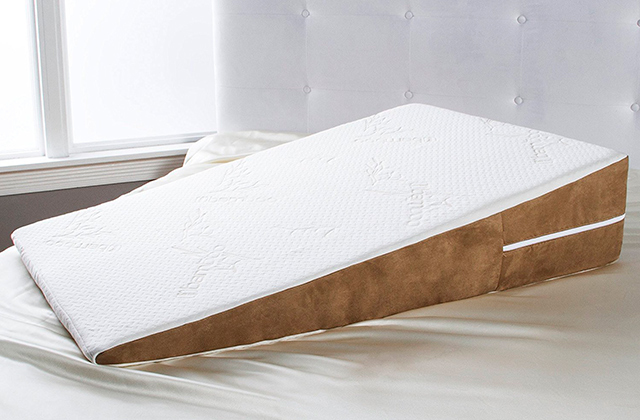 The pump can be used for deflating the mattress - just select the right mode and your bed will run flat in no time. Thanks to this inflatable bed, you can use the full space of your flat and enjoy a comfortable sleep at night. This single-size Intex inflatable bed can give you a quality sleep no matter where you go and where you are. When folded down, this model takes very little place, so you can easily take it with you on a trip. The Intex air mattress is made of high-quality PVC and has a nice colouring, so the mattress fits into any interior. The flocked top of the air bed is not just soft but also does not allow a bedsheet to slide off when you sleep. 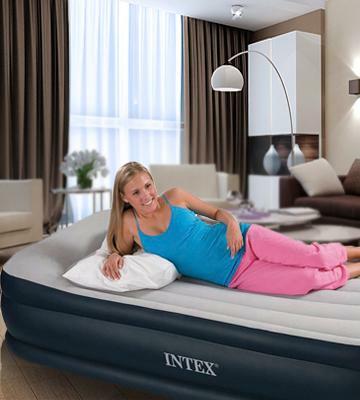 Deluxe air mattresses are among the most popular Intex products. The air mattress has a vinyl side around the perimeter (for additional stiffness) and a small built-in headrest allowing you to sleep even without a pillow. The air mattress is designed for one person, so you can create a sleeping place in no time. 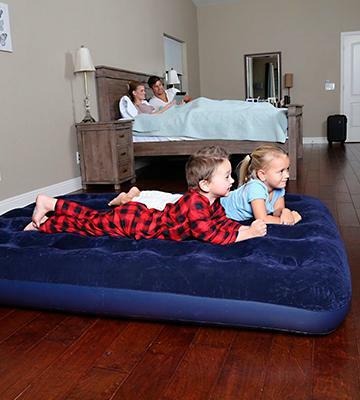 This air bed is perfect for people who travel a lot or who adore camping. Of course, the air mattress can provide a sleeping place for a guest or relative who stays overnight in your flat (house) or in your dormitory room. The airbed is easy to use and clean. There is a built-in air pump that allows you to inflate it very quickly (approximately 2 minutes). The pump will also help you deflate the bed. Every person sometimes needs to stay overnight at someone else's place or to provide a sleeping place for guests or relatives. It's easy if you own a mansion with lots of guest bedrooms. However, what if your house isn't big enough? Or else, what if you live in a rented flat? 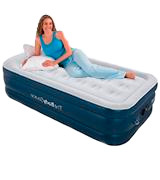 Such a casual yet difficult situation provides an easy way out - an inflatable air mattress! When stored, an air bed takes very little place and you can keep it in a pantry, under your sofa, etc. 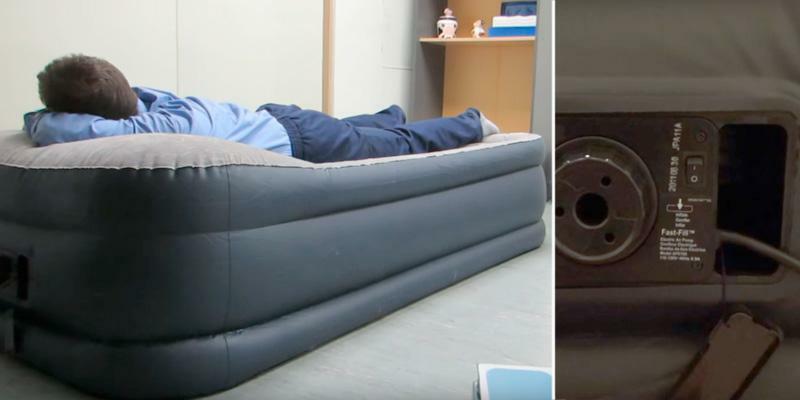 An airbed is always at hand and if you need a sleeping place, just unfold it, connect to the socket, and switch the pump on - within a couple of minutes your bed will be ready. Also, inflated air mattresses can be used for sleeping on a regular basis if you like sleeping on extra-soft surfaces. Very often, such air beds are more comfortable than conventional ones because of their orthopaedic capabilities. People suffering from a backache certainly need to sleep on air mattresses in order to quell the pain and ensure an even backbone position. Finally, any pump air mattress is compact enough for transportation if you are going somewhere. For example, it's a perfect choice for campers as well as for people who often spend several days in a country house. If you drive a lot and need to sleep right in your car, make sure to read about the best car air beds and you will definitely find the right one for yourself. There's one more solution to find a space-saving sleeping place - folding beds, so we recommend you to consider getting one of them, too. The first thing you need to decide upon when choosing an air bed is its size. Blow-up mattresses are different in size and you should choose the one you need. For example, if you buy this item for your relatives or guests, you know perfectly well how tall they are, whereas if you need an airbed for kids, it can be much smaller. As usual, a comfortable pump air mattress is 188-198 cm long, while the width of the bed may differ significantly. Let's say a few words about that. JR. TWIN air beds are usually around 76 cm wide and these are single beds. One person with a normal weight feels perfectly well on this kind of bed. If a person is really tall and a bit plump, he or she should use a TWIN bed which has the width of about 99 cm. 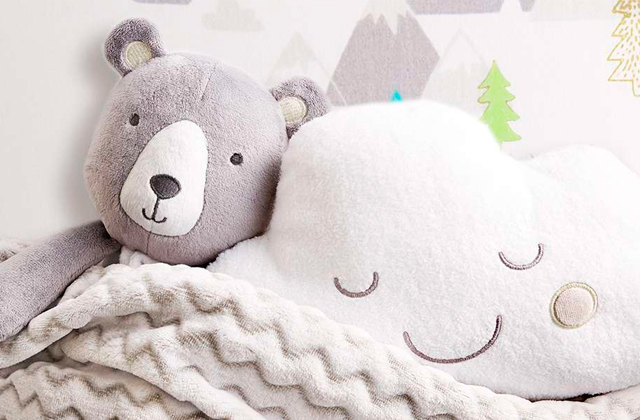 If you need a bed for two people to sleep on, JR. TWIN and TWIN will be too small. The minimum width for two sleepers is 140 cm and this kind of bed is called DOUBLE. Double beds, that are even wider, are called QUEEN size beds and they are usually about 178 cm wide. No need to mention, you can sleep in your favourite position on such a huge bed. No need to say, pump air mattresses are made of different materials but the vast majority are made of PVC. This material has proven to be durable and firm. The top part of the air bed should be examined first hand. As usual, it's flocked or 'suede' that is very handy since customers don't want bedsheets to skid off while they are sleeping. Note that a flocked top is more water-resistant. Concerning the inner part of the air bed matters, the sections consist either of coils or of channel beams. The beds with channel beams might lose their shape in case of frequent use. The air mattresses with coils are sturdier and ensure a more even weight distribution. Also, there are airbeds with headrests, so they can be used even without pillows. Some air mattresses have a combined structure: they consist of 2 separate parts that you can fold out and get a really wide bed. Next, consider how convenient in use each air bed is. There are several ways to inflate an air mattress. Some models are equipped with built-in air pumps, which means you don't need any extra tools to blow them up. Other models come with no pumps and, therefore, require an external pump (either electric or mechanical). Moreover, the air beds with built-in pumps also differ: some of them can just inflate and deflate an air mattress whereas others can maintain the pressure level and pump the mattress up if necessary. If you plan to use a pump air mattress at home, you should choose a model with a built-in air pump. However, if you travel a lot or like camping, you'd better pick an airbed with no pump (and use a car air pump, for example). If the bed you are going to buy has a built-in pump, find out how fast it inflates the mattress. Waiting too long will be rather annoying. Finally, don't forget to check the size of an air mattress in a folded position. This way you will know how much space it needs for storage and transportation. 1. How to Choose an Air Bed, Overstock. 2. Lisa Zamosky How to Pick Your Perfect Mattress, WebMD. 3. Choose An Air Mattress That Your Guests Will Love, Sleep. 4. How to Inflate an Air Mattress, wikiHow. 5. Air mattress, Wikipedia. November 7, 2016.